What is Regal Skin Healing Spray? Common skin conditions seen by veterinarians are varied and have many different causes, but incessant scratching, red, inflamed areas on the skin, flaking skin and/or hair loss are usually the signs you’ll notice first. Conditions include eczema, hot spots, rashes, mange, allergies and ringworm. Infections from poorly treated wounds are also common. What are the causes of skin problems in dogs? The most common causes of skin problems are allergies, infections or a lowered immune function. Allergies can develop due to fleas, poor diet or environmental factors, such as chemicals or grass. Certain bacteria, parasites or viruses can cause infections, especially in compromised skin. An immune system that isn’t performing at its best, will be slow to react to any invaders and the skin is usually the first to suffer. Calendula is a European herb with a long history of healing all types of skin problems. It is classified as a ‘vulnerary’, i.e. wound healer, and has anti-inflammatory, antiseptic and antimicrobial (antibacterial, antiviral, antifungal) properties. It helps cuts, grazes, minor wounds, burns, scalds and bites to heal properly and helps to prevent infection. Calendula is a very gentle, non-toxic plant that can be used for a very wide variety of skin problems – rash, eczema, psoriasis, acne, irritated or inflamed patches of skin, dermatitis of all kinds, ringworm etc. Possibly also of use in alopecia (hair loss) in dogs (De Bairacli Levy 1985). It has a history of use as a wound-cleansing agent (Wynn & Fougere 2007). It has been used to help with sun damaged skin and with skin cancers. St John’s Wort is another herbal vulnerary with a long history of use for minor wounds and cuts, abrasions, burns and skin ulcers (Wynn & Fougere 2007). It is anti-inflammatory and promotes healing of wounds. It is useful as a mild painkiller and is especially good for injuries to the nerve rich areas such as the paws, nose and tail. May also help with viral eruptions such as herpes or shingles. Hypericum combines well with and potentiates the effect of Calendula – it was marketed as HYPERCALTM. Comfrey is one of the greatest wound healers in Western herbal medicine. It has powerful anti-inflammatory effects and promotes the healing of tissues; it literally ‘glues’ the tissues back together – even bones – and for this reason was known as ‘knitbone’. It contains allantoin which promotes cell division and therefore speeds repair of the skin. It is an important medicine for wounds of all kinds, bruises, blood blisters, eczema, psoriasis, rashes, burns, scalds etc. It soothes, moisturises and heals. It is cooling, anti-inflammatory, antimicrobial (antibacterial, antiviral, antifungal). It has been used to stop bleeding. It has been used to heal ulcers of all kinds, including skin cancers. Comfrey contains potentially toxic (when ingested) pyrrolizidine alkaloids and for this reason internal use is not recommended anymore. These alkaloids are poorly absorbed through the skin and so Comfrey is considered safe for external application (Wynn & Fougere 2007). Nettle Leaf has strong soothing, anti-inflammatory effects. It is primarily included in this formula for the treatment of itching. It is also very good for burns and scalds and helps with bites and stings, particularly if they are itching. Nettle is very good for red, raised, itching skin eruptions such as allergic reactions, hives, bites and stings. Nettle can help stop bleeding. It can assist with the itching of any skin condition such as eczema or other dermatitis. Liquorice root extract, when used topically is a strong anti-inflammatory and has antiviral effects. It has been investigated in atopic dermatitis (eczema) and been found to be effective in reducing redness, swelling and itching within 2 weeks of use (Saeedi 2003). Liquorice outperformed phenytoin cream in treating open skin wounds in rabbits (Arzi 2003). Aloe gel is soothing, cooling, anti-inflammatory, pain-killing (cf. Hypericum) and moisturising. It is a vulnerary which accelerates wound healing by stimulating the appropriate cells. It has been used for seborrhoeic dermatitis, fungal infection and pruritis ani (itchy bum). It is hydrating, insulating and protective. It can be used for burns, sunburn and pressure sores (as can Comfrey, Hypericum and Calendula). It can be used to treat resistant ulcers (cf. Symphytum, Calendula) and is also known for treating frostbite. Swain (1992) found that Aloe vera stimulated early wound healing in foot pad injury in Beagles. FOR EXTERNAL USE ONLY. SERIOUS WOUNDS (e.g.. DEEP OR GAPING) ALWAYS NEED VETERINARY ATTENTION. There is a possibility that the herbs in this product may interact with other topical medicines if applied simultaneously. Check with your veterinarian if in doubt. Generally the ingredients are very well tolerated. Allergic reactions, including a rash, are possible. As this spray is for external use only it is not recommended for cats due to their self-grooming habits. Insufficient data is available, therefore avoid during pregnancy and lactation. THIS PRODUCT DOES NOT REPLACE VETERINARY CARE. WHERE SYMPTOMS PERSIST OR WORSEN, DISCONTINUE USE AND CONSULT A VETERINARIAN. How can I naturally care for the health of my dog’s skin and coat? Besides ensuring a balanced, protein-rich diet, adequate parasite control and regular grooming, what else can you do? Supplement your dog’s diet with fresh oily fish such as salmon, tuna or sardines. It’s crazy how much most dogs love this! Massage some coconut milk into the skin for several minutes before washing. An oatmeal bath helps soothe the skin, relieves itching and leaves the coat soft and shiny. Grind one cup of oats into a fine powder. Stir into a tub of lukewarm water until the water appears cloudy. Avoiding the eyes, pour the solution all over your dog and massage for 10-15 minutes before rinsing off thoroughly. A final rinse of either rosemary tincture (simply soak a few chopped branches in a jug of boiling water until cool) or diluted cider vinegar will help deter many pests including fleas, ticks and lice and it also leaves a glossy coat that smells great. Works for kids and adults too! Dogs often left outside will naturally develop thick and dry coats for protection against the elements. Living without adequate shelter can also lead to sunburn and extended exposure to parasites. If your dog lives outside more than inside, consider providing sufficient shelter that is warm in winter and cool in summer. Keep it clean and pest-free. You may initially need to encourage your dog to use it. Try placing his food bowl and blanket or kennel there. Reward good behaviour, i.e. using the shelter, as often as it takes. Also read: Skin Care Remedy and Flea Spray for more tips on caring for your furry friend. If the wound bleeds profusely or doesn’t start healing within a few days, gets worse or develops an unpleasant odour, visit your vet immediately. 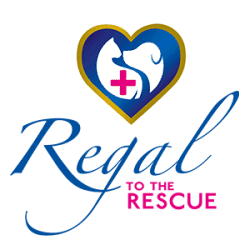 These tips are for minor injuries only and do not replace veterinary care. Never give your pet any medication unless directed to do so by a vet. 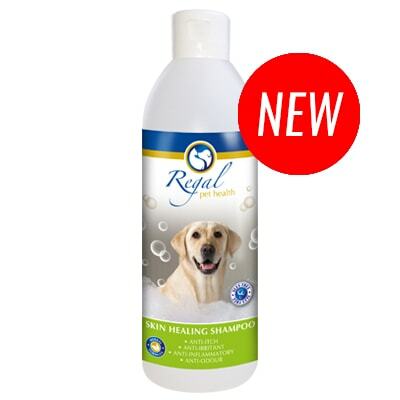 Minor wounds, burns and stings can be treated with Regal’s Skin Healing Spray to aid healing and help prevent infection. To boost the immune system and to assist with healing from the inside, depending on the condition, consider using Regal’s Immune Health, Skin Care Remedy or Recover and Heal. Your darling probably got a fright. Keep calm, provide comfort and speak in a soothing voice. This will help keep him/her calm enough for treatment and reduce stress levels for both of you. The first step in any first aid when dealing with compromised skin, is to stop the bleeding. If it doesn’t stop bleeding by itself almost immediately, direct pressure with a clean towel or cloth is the best way to do this. The second step is to help prevent infection. Squirt saline solution through the wound. A large syringe is ideal for this. Do not scrub or wipe directly in the wound. You may see blood already clotting by this time. This should also help get rid of any sand or small bits of grass stuck in the wound. Bites from other dogs will be filled with bacteria, so make sure you flush these out well. Puncture wounds should be left open and often shallow scrapes are best left open too, but you may want to put a light dressing on cuts or deeper grazes to prevent your dog from licking it open again. No, a dog’s saliva is not healing and the tongue can introduce unneeded germs to the site, causing an infection. If your dog can’t leave it alone, you may want to get an e-collar or cone from your vet. They might look awkward for a short while, but the wound will heal much quicker without disturbance. Spray some Skin Healing Spray over a shallow wound (not for deep cuts or puncture wounds) two or three times a day or on each new dressing. It will aid healing and help prevent infection. Cool the area immediately with a cold compress – a bag of frozen peas works best. If the burn appears more severe with broken or blistered skin, please consult your veterinarian immediately. Spray Skin Healing Spray on the skin twice a day until redness disappears. If your dog is allergic, you may not know this until it’s too late, so keep an eye out for extreme reactions, in which case you should immediately consult your vet. This includes facial swelling, vomiting, breathing difficulty or collapse. If there is a stinger left behind, remove it with tweezers or credit card, being careful to grasp the actual stinger and not to squeeze the venom sac. Apply a cool compress wrapped in a clean cloth and then spray with Skin Healing Spray twice a day until healed.